Anti-Armenianism (or Anti-Armenism) is hostility toward or prejudice against Armenian people, Armenian culture and the Republic of Armenia, which can range in expression from individual hatred to institutionalized persecution. Several organizations have stated that difficulties currently experienced by the Armenian minority in Turkey are a result of an Anti-Armenian attitude by the Turkish government as well as by nationalist groups such as the Grey Wolves. Such sentiments are also prevalent in Azerbaijan as well because of stem from the loss of the Nagorno-Karabakh War and also for political reasons. Anti-Armenianism today often lacks a racial and cultural basis and appears to be mostly based on geopolitics and history in addition to diplomatic and strategic interests involving the modern states of Turkey and Azerbaijan. The ongoing issues of the Armenian Genocide and Nagorno-Karabakh are two examples of intense Anti-Armenianism in both countries. These facts can themselves imply a direct hate towards Armenians as a nation (especially in the case of Azerbaijan), but they tend to reflect the various historical and political tensions between these countries. The Armenian people have suffered persecution by the Turkish government for over a century. In 1895, revolts among the Armenian subjects of the Ottoman Empire lead to Sultan Hamid's decision to massacre tens of thousands of Armenians in the Hamidian massacres. According to Armenian and most Western scholars, during World War One, the Turkish government massacred up to 1.5 million Armenians in a genocide known as the Armenian Genocide. The position of the Turkish government is that the Armenians who died were casualties of the expected hardships of war, the casualties cited are exaggerated, and that there was no genocide. Those that have torn down this nation are Greek, Armenian and Jew traitors, and Kurdish, Bosnian and Albanians… How can you, as a Turk, tolerate these dirty minorities. Remove from within the Armenians and Kurds and all Turkish enemies. In 2004, the Grey Wolves, a youth organization founded by Türkeş, successfully prevented the screening of Atom Egoyan's Ararat, a film about the Armenian Genocide. During the Soviet area, Armenians and Azerbaijanis lived in peace. When the conflict over Nagorno-Karabakh broke out, however, this changed radically. There is an opinion that much of the anti-Armenian sentiments among the Azeri people today stem from the loss of the Nagorno-Karabakh War and the Khojaly Massacre (1992) perpetrated by Armenian irregulars against the Azeris during the war. However, it should also be noted that one of the events precipitating the conflict was a pogroms perpetrateds by Azeris against ethnic Armenians in the Azeri towns of Sumgait (1988), Kirovabad (Ganja) (1988) and Baku (1990) and that the Azeris themselves committed massacres against Armenians during the war, such as the attack on the town of Maraghar (1992). In 2004, Azeri lieutenant Ramil Safarov murdered the Armenian lieutenant Gurgen Markaryan at a Partnership for Peace NATO program. Safarov's crime resulted in contradictory reactions in his home country: some propagated granting him the status of a national hero, while others expressed severe criticism and condemned Safarov for murder.. Starting in 1998, Armenia began accusing Azerbaijan of embarking on a campaign of destroying a cemetery of finely carved Armenian khachkars in the Nakhichevan Autonomous Republic. On May 30, 2006, Azerbaijan barred the European Parliament from inspecting and examining the ancient burial site. Charles Tannock, British Conservative Party foreign affairs spokesman in the European parliament, stated: "This is very similar to the Buddha statues destroyed by the Taliban. They have concreted the area over and turned it into a military camp. If they have nothing to hide then we should be allowed to inspect the terrain." Hannes Swoboda, an Austrian Socialist MEP and member of the committee barred from examining the site, said he hopes a visit can be arranged in the autumn. He stated that "if they do not allow us to go, we have a clear hint that something bad has happened. If something is hidden we want to ask why. It can only be because some of the allegations are true." He also warned: "One of the major elements of any country that wants to come close to Europe is that the cultural heritage of neighbors is respected." Recent surges of Pan-Slavic nationalism in Russia have prompted violence against non-Slavic minorities, including Georgians, Jews and Armenians. Six Armenians were killed by Russian neo-Nazis in 2006 out of 18 total racist-related deaths. So far the reaction of the Russian government to these murders has been subdued, often failing to term the incidents hate crimes and declining to strongly condemn them, causing some to suspect racist elements working within the Russian state. Historically, Armenians have generally had good relations with the Russian people. For several months in 1994, Ahmet Cosar going by the alias of Serdar Argic posted thousands of messages, claiming that the Armenian Genocide didn't happen or that Armenians massacred Turks, on Usenet newsgroup threads mentioning the word Turkey. 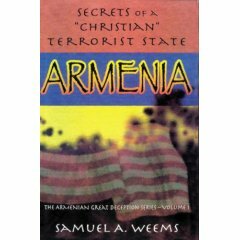 Samuel Weems published the book Armenia: The Secrets of a Christian Terrorist State in May of 2002. Weems has made such claims as the "number one export of Armenia is terrorism" and that there was no Armenian Genocide. American historian Justin McCarthy is known for his controversial support of Turkey's denial of the Armenian Genocide. ↑ Hamidian Massacres, Armenian Genocide. ↑ Template:Tr icon Ülkü Ocaklari: Ararat Yayinlanamaz. ↑ Template:Tr icon Ülkü Ocaklari: ARARAT'I Cesaretiniz Varsa Yayinlayin ! ↑ Survivors of the Maraghar Massacre, Christianity Today. ↑ Murder Case Judgement Reverberates Around Caucasus, War and Peace Reporting. ↑ World Watches In Silence As Azerbaijan Wipes Out Armenian Culture. ↑ Weems Interview, Tall Armenian Tale. This page was last edited on 3 April 2007, at 04:45.